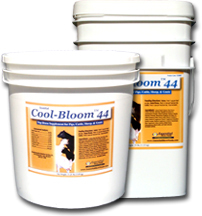 Essential Cool-Bloom™ 44 is a unique top-dress feed that contains seaweed (kelp meal), rice bran, fish, egg, yeast and much more. Cool-Bloom may help to lower the internal temperature of your animal, which will increase their consumption of feed. Cool-Bloom improves rib shape, skin and coat quality and enhances digestion and absorption within your animal.